Still on the archaeological aspects of mysteries. This one here is one of my personal favorites because I've always believed in alternate worlds and would really love to travel to the other side if possible so seeing this one with all the evidence lingering all over it with the legends that goes with it always stirs up this major curiosity and imaginations in me. Southern Peru, in the Hayu Marca Mountains an hour drive from the City of Puno a.k.a The city of gods by most locals lies the mysterious door-like structure known as The door or the Puerta de Hayu Marca (Gate of the Gods) has been, at some time in the distant past, carved out of a natural rock face and in all, measures exactly 23′ in height and width, with a smaller alcove in the center at the base which measures in at just under 6′ in height. According to a particular interesting legend about the gate from the Book Secrets of the Andes by Brother Phillip, an Incan priest of the Temple of the Seven Rays named Amaru Meru (Lord Meru, Aramu Muru) ran from his temple with a sacred golden disk known as “the key of the gods of the seven rays”, and hid in the mountains of Hayu Marca. He eventually came upon the doorway which was being watched by some shamen priests. He showed them the key of the gods and a ritual was performed with the conclusion of a magical occurrence initiated by the golden disk which opened the portal, and according to the legend blue light did emanate from a tunnel inside. The priest Amaru Meru handed the golden disk to the shamen and then passed through the portal was never seen again. Archeologists have observed a small hand sized circular depression on the right hand side of the small entranceway, and have theorized that this is where a small disk could be placed on the rock. This mysterious door has also had some cultic believers saying the door leads to some dark alternate (this somehow reminds me of Dc's Dark Night Metal) universe enveloped by Black Magic . Some locals claims it opens at 12midnight. 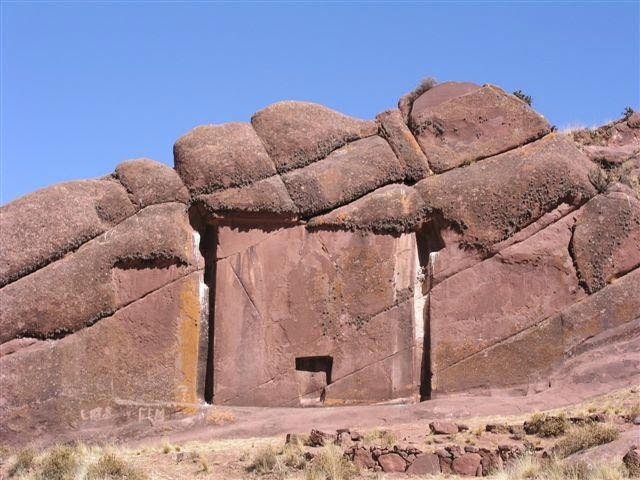 So my question is this, did the native south Americans had a some kinda Star gate for magical interstellar travel thousands of years ago? If true in any possible way with a little concrete evidence, i would be on the next plane to Peru sharperly! !